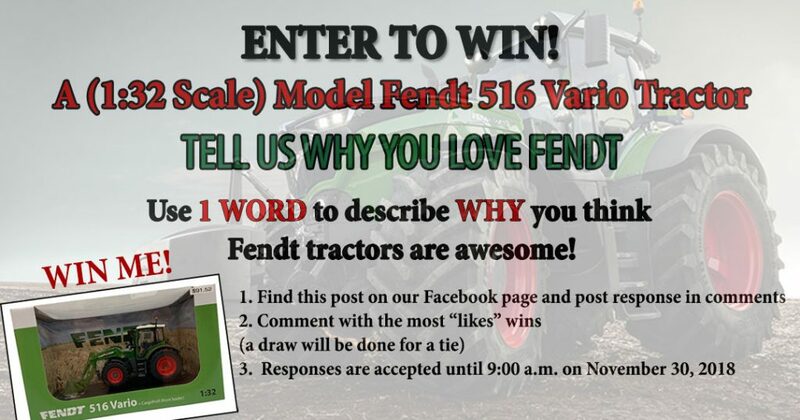 Tell us why you love Fendt! Do you own a Fendt tractor and love it? We want to know! Find this post on our Facebook page and have a chance to win this small scale model Fendt tractor. Share the post and have your friends like your comment to increase your chances of winning! Contest begins November 28, 2018 at 3 p.m. and runs until Friday, November 30, 2018 at 9 a.m.
*Please note: prize will not be delivered and must be picked up in store. Read the terms and conditions here: GIVEAWAY RULES. By entering this contest you are agreeing to the terms and conditions.